First thing that catches the eye in his natal chart is Jupiter conjunct Sun in Sagittarius, with Neptune and Mercury sharing the same sign, what suggests a strong need to get self-confirmation by expressing one´s opinions and convictions. Augmented self-confidence, enthusiasm and impulsiveness are also characteristic for emphasized Fire signs, as well as self-indulgence. With Jupiter quindecile Saturn rx, there is a challenge of strong, undercurrent need to prove the point and to feel &righter than right&. Both behavior patterns seem to be related to the relationship dynamic with the father figure. There are few significant measurements that reflect his quick political rise and challenges he is facing now. In November 2008, with the final hit of transiting Jupiter square Uranus zu Guttenberg was appointed Secretary General of the CSU. In February 2009 he became German Minister of Economics and Technology. Transiting Pluto makes a first-hit square to its natal position in mid January. This picture always suggests an important time in the development and significant changes off inner and outer perspectives. Pluto transit activates also natal Mars/Uranus and reflects sudden and rapid developments. Time until August 2009 was marked with beneficial Solar Arcs of Moon Node to Jupiter and Mars. 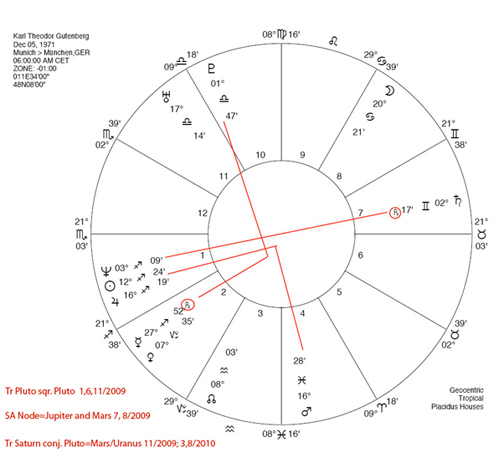 In June, transiting Pluto made its second hit to natal Pluto. By this time German media titled zu Guttenberg &the baron of the hearts& and he was the most popular politician in the country. Earlier this year he gained broad popularity with statements related to Opel selling, what led to his public image of &authentic straight-talker&. This is a description that fits what a person with emphasized Sagittarius finds to be a desirable self-image. End of October 2009, he became Federal Minister of Defence. On 13th of November he visits German troops in Afghanistan and afterwards makes statements that become the source of biggest controversy and serious challenge for his political profile. Measurements for November show the final hit of Pluto to Pluto, and also the first hit of Saturn conjunction to Pluto and Mars/Uranus midpoint. Saturn - Pluto connection always suggests times when reality principle (or what we have learned about reality by that moment) seems to be obstructive and we feel compelled to concentrate all our available resources on our central goals. With the end of the transit that can last up to a year, we realize gradually that our strategy or our goals have to be adjusted to those aspects of reality that we did not consider before. Tr. Saturn over Mars/Uranus midpoint suggests &a clash between controls and freest spirit, or potential battles and separation& 1. These transits color zu Guttenberg‘s start as Minister of Defense. January to March 2010 measurements show augmented need for justification, &feeling righter than right& and upset: transiting Jupiter makes aspects with Saturn - Neptune opposition, with Sun - Jupiter conjunction and activates the quindecile mentioned above. In the same time, the retrograde Saturn makes its second hit to Pluto=Mars/Uranus and the "Kunduz affair", that for zu Guttenberg started with the first hit, might take its second peak and make further vital influence on his political career. This issue seems not be settled until August-September 2010, after Saturn will make its last hit to the midpoint picture. Measurments seem to be related to the federal fact-finding Committee where zu Guttenberg is one of the central figures. However the things turn out by the end of 2010, Saturn - Pluto transit suggests they might turn to be different than zu Guttenberg would desire. There might be some feeling of loss involved. But Saturn - Pluto contacts bring also insights in the aspects of reality not taken into account before and open thus the possibility to find the more stable foundation for the future. And 2011 with transiting uranus opposition to natal Pluto seems to promise fresh developments for zu Guttenberg. 1) From Noel Tyl: "Solar Arc"